Boston has several Luxury Hotels, including the Fairmont Battery Wharf, Boston Harbor Hotel, Langham Hotel, Ritz-Carlton, Four Seasons, Taj Boston, and Mandarin Oriental Hotel. All hotels rate four to five stars, and have reputations of high service. There are a few subtle differences in amenities of the various Luxury Hotels in Boston. A great way to evaluate your decision is to go to the main Booking Page, select Boston and your travel dates, and then click the rating link. Your search results will be sorted by Highest Star Rating. Then you can select up to 5 hotels, and compare their features. A pop-up window will compare amenities of the selected hotels to help in your decision making process. You can also read the reviews of each hotel individually. The other main criteria for making a decision is location. If you are traveling on business you may prefer a hotel near the Waterfront or Financial District. If you are traveling for pleasure, you may want to be closer to the shopping malls in the Back Bay. Ambiance for your spouse may overrule all practical criteria of course. Please remember that time of year may influence the ambiance of certain areas of the city due to seasonal attractions, weather conditions, etc. The Fairmont Battery Wharf hotel is located in the North End of Boston. It's near the Little Italy section of the city. During summer there are Italian street festivals, which allow walking up Hanover Street and enjoying ethnic foods, crowds, and music if you have an affinity for such events. St. Anthony's Feast and the Fisherman's Feast are the most popular festivals, and take place in August. The waterfront ambiance is a huge plus for the Fairmont, but a cab or long walk is required to get to the subway or to other parts of the city. Logan Airport is only about 15 minutes away, subject to traffic conditions. Boston Harbor Hotel has a super location at Rowe's Wharf. 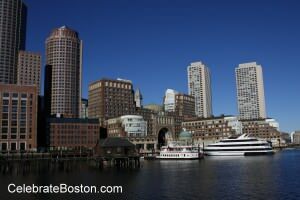 Long Wharf, with its many attractions like New England Aquarium, are within short walking distance. Faneuil Hall Marketplace and the Financial District are also nearby. BHH probably ranks the highest for location as it is suited for both business and pleasure visits to Boston. During summer, the hotel offers free outdoor entertainment, with Movies by Moonlight and Blues Barge series being very popular. The hotel is a great venue for wedding receptions, due to its prominent waterfront location and also that horse drawn carriages often pass by the hotel. Logan Airport is about 20 minutes away. 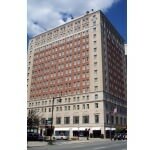 The Langham Hotel has a great location in Post Office Square. Most of the Financial District is within short walking distance from the hotel. The waterfront is also within walking distance east, and Faneuil Hall Marketplace is just north up Congress Street. The hotel's west rooms face a beautiful park in Post Office Square, which is often used as a venue for wedding reception photos. Horse & Buggy carriages pass by the Langham, which makes a romantic departure for the bride & groom after a reception. Logan Airport is about 15 minutes away. Ritz-Carlton Boston Common has the highest reputation for service in Boston. It's located on Avery Street near Boston Common. Beautiful views of Boston Common and the Back Bay District can be attained from its west facing rooms. A cab ride is probably necessary to reach the Financial District, Waterfront, or Prudential Center, but many attractions and businesses can be reached by walking up Tremont Street. The start of Boston's historic Freedom Trail and its information booth, are just two blocks up Tremont Street. The Ritz-Carlton is located at the north end of the Theater District, so one can walk to the Opera House or Citi Performing Arts Center from the hotel. Logan Airport is about 25 minutes away. The Four Seasons Hotel Boston is located right across from the Public Garden on Boylston Street. During summer, Swan Boat rides and the beautiful gardens are visible from the hotel's north facing rooms. The area is known as Park Square, and has quick access via cab or subway to the Waterfront (east) or Back Bay (west). Boylston and Newbury Streets are popular shopping destinations, with Copley Square being three blocks west up Boylston Street. The ambiance of the hotel is greatly enhanced in Summer due to the Public Garden and Boston Common being in such proximity to the hotel. Logan Airport is about 25 minutes away. Taj Boston Hotel is located at Arlington and Newbury Streets near the edge of the Back Bay District. The hotel offers beautiful views of the Boston skyline in the upper stories as it has unobstructed views in three directions. Boston Common and skyscrapers can be seen to the east, and the Back Bay District, with its old Victorian brownstone homes to the west. The "Front Door" of the Public Garden is just across Arlington Street, with the famous George Washington Statue near the west gate, and the Swan Boats being nearby in the center of the park. One can walk up Newbury Street and shop, or walk 3 blocks to Dartmouth Street and cross over to Copley Square. Copley Place is located behind the Westin Hotel in the square. The Hatch Shell is also near the hotel, with free open-air concerts and movies held there during the Spring and Summer. Logan Airport is about 25 minutes away. 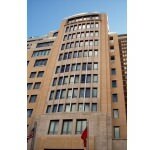 The Mandarin Oriental Boston Hotel attains the ultimate location in Boston for shopping. Located in the Back Bay District, it's adjacent to the Prudential Center mall, is one block away from the Newbury Street shopping district, and only three blocks away from Copley Place. Copley Place can even be reached via enclosed atrium-style walkways during winter or inclement weather. Prudential Skywalk and Top of the Hub restaurant are also located within the complex. Kenmore Square and Fenway Park are about a half-mile to the west. The downtown area is a short cab or subway ride east, but the Waterfront District may take some time to get to via cab during rush hours. Logan Airport is about 30 minutes away. • Select Hotels & Compare Hotel Amenities using the Booking Engine. • Alternatively, click a link below for an overview of each hotel. Area: Boston Common, Map Pin "D"
Area: Boston Common, Map Pin "E"
Area: Boston Common, Map Pin "F"
Area: Prudential Center, Map Pin "G"